For the past couple of years, we have been held in high regard on the international scene appearing on magazine best of lists, following our incredible sporting teams, and watching local artists hit hard on the music scene. So this contest right here is right on time. Tell me, what do you think about when you hear the term “theme song”? While we all have our favourites, my own personal theme song plays in my head when I’m struttin’ down the road on a feel-good day (cue “Bad Mama Jama”). Well, CBC Toronto is looking for a special someone to give Toronto their individual touch with an original theme song all our own. 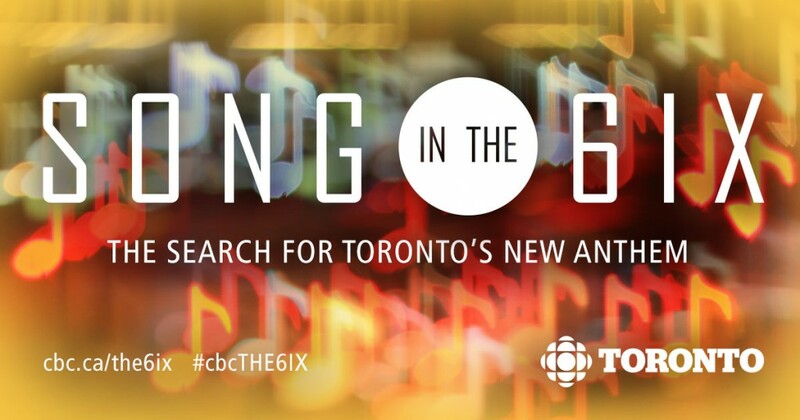 On January 18th, CBC Toronto launched “Song In The 6ix”, a contest asking GTA residents to submit a song about the City. They would like to hear your love letter to The 6ix, if you will. Do you love Toronto? Why? What would be your reasons to tell people to run on down to Toronto? Tell them in a song! Any artist in any genre can enter a video of their performance, regardless of experience. And the best part? There is a $10K prize waiting for the winner, along with a music video produced by CBC Toronto that will feature the artist, CBC Toronto hosts/talent, and prominent Torontonians.